The Breakdown: Could the Massey Mine Disaster Have Been Prevented? Christopher Hayes asks Ken Ward Jr, renowned reporter for the Charleston Gazette, whether this grave incident could be the catalyst for mine safety reform and regulator empowerment. In horrific explosion in West Virginia, twenty-nine miners lost their lives. This week on The Breakdown, guest Ken Ward Jr. of the Charleston Gazette sheds light on the corporate negligence and weak government enforcement that contributed to the tragedy. Early this month, a devastating explosion rocked the Upper Big Branch mine in West Virginia, ending the lives of twenty-nine miners. In the days following the tragedy, it has become increasingly apparent that the explosion was not just a horrific accident, but the deadly consequence of a mountain of safety violations and negligence on the part of the mine’s ownership, Massey Energy, helmed by Don Blakenship. Could the Massey disaster have been prevented with stronger government enforcement? Will this grave incident be the catalyst for mine safety reform and regulator empowerment? 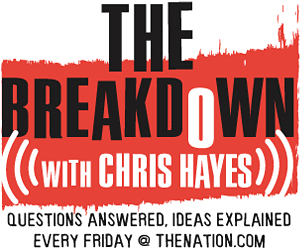 DC Editor Christopher Hayes asks Ken Ward Jr, the renowned reporter for the Charleston Gazette, these questions and more this week on The Breakdown. Ken Ward’s blog for the Gazette, Coal Tattoo. The Washington Independent has created a tally sheet of all of Massey Energy’s mine violations here. President Obama says government and Massey Energy share the blame for the mine tragedy here.